A U of I Crop Scientist will lead a team of researchers on a five-year study of new crops that could contribute to the production of affordable, sustainable sources for market-ready fuels and other valuable products. U of I College of Agricultural, Consumer, and Environmental Sciences (ACES) and Crop Sciences Associate Professor D.K. Lee and his collaborators were awarded $5 million from the U.S. Department of Energy (DOE) for a study titled “Next-Generation Feedstocks for the Emerging Bioeconomy.” Other team members in the study funded by the DOE’s Bioenergy Technologies Office (BETO) are from the U.S. Department of Agriculture’s Agricultural Research Service, Iowa State University, South Dakota State University, Argonne National Laboratory, Idaho National Laboratory, and Antares Group Inc. They will collaborate with industry partners POET-DSM Advanced Biofuels LLC, Enginuity Worldwide LLC, and The Climate Corp.
“To provide sustainable sources of energy for an ever-growing world population, we must build a new energy plan on a bioeconomy platform,” Lee said. “That means, for starters, that we need to know which energy crops will be the most productive and valuable — and best for the environment. 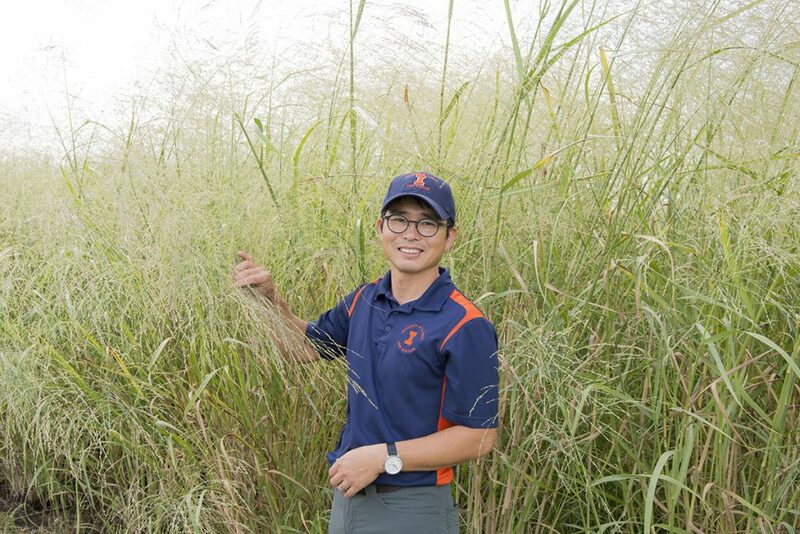 The team will assess field-scale yield of advanced switchgrass varieties such as “Independence” — which was developed by Lee — for pre-commercialization. Team members also will examine other warm-season perennial grasses such as switchgrass blends, big bluestem, prairie cordgrass, and Miscanthus. The Institute for Sustainability, Energy, and Environment (iSEE) was instrumental in helping Lee and his team land the grant. iSEE, which helped put forth the successful proposal, is an administrative partner along with the Carl R. Woese Institute for Genomic Biology (IGB) in the new Center for Advanced Bioenergy and Bioproducts Innovation (CABBI), a DOE Bioenergy Research Center that is studying energy crop trait improvement; automated conversion of biomass into useful, valuable chemicals; and studies on the economic and environmental sustainability of CABBI crops and processes. “By including CABBI, the national labs, and industry members, along with other partners’ large Midwest energy crop research sites, we can loop our real-world data into today’s bioeconomy industry,” Lee said. “This will help us find the right varieties of grasses — and speed adoption of practices that increase the growth of this new energy supply while reducing cost. “Agricultural systems must adapt to increasing demands for food, while facing increasing threats, particularly related with the loss of ecosystem services. To meet this challenge, future food production needs new agricultural management strategies that increase ecosystem services while enhancing food production. “(Gomez-Casanovas) will investigate how emerging adaptive multi-paddock grazing management (AMP) that has the potential to increase soil carbon sequestration compared to the ‘business as usual’ continuous grazing (CG) affects the delivery of regulating services – greenhouse gas (GHG) regulation and water use efficiency (WUE) – from grazed pastures used for livestock production.